Vrtical is a Mexican architectural practice which came up with an innovative urban development plan for the municipality of Tlaxco in 2015. The primary goal was to provide incentives for development of the local economy, supplying the population with the means and places needed to encourage tourism. The Tlaxco Artesan Market is the first project to be completed under the masterplan. 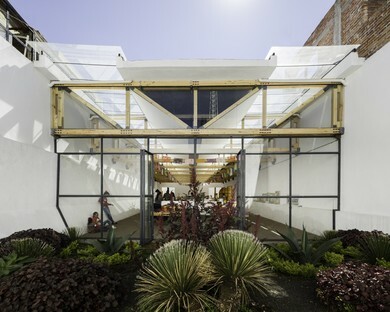 The town of Tlaxco, halfway between Mexico City and the Gulf, opened a new Artesan Market last year designed by the young architects of Vrtical and financed by the municipality. Tlaxco is a small town, though with a population of 15,000 it is considered large in the region of Tlaxcala. In 2015 it was included in the national "Pueblos Magicos" programme aimed at boosting potential for tourism, and the town has all the prerequisites for attracting tourists: located at an altitude of 2600 m in the Sierra Volcanica Transversal, it was awarded the Premio Nacional de Restauración Histórica in 2001. Vrtical, the studio run by Luis Beltran Del Río, Andrew Sosa and Ana Isabel Ruiz, has been working in Mexico City since 2014, and in its very first year came up with a participatory urban development plan for the municipality of Tlaxco to implement the Pueblos Magicos programme. 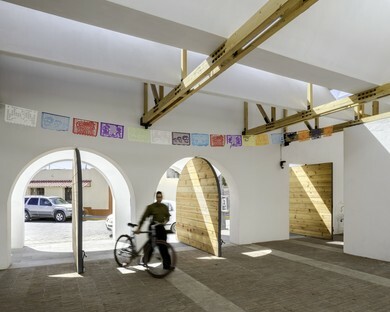 The Tlaxco Artesan Market is the first project to be constructed under the programme, with the support of the entire community, and will offer new opportunities for independent artesans in the local community. This is no ordinary shopping centre! Vrtical’s project for the town is not merely beautiful and functional, but social as well, ensuring better use of public space. Vrtical defines itself as "a workshop for the democratisation of architectural service", and, in line with this principle, the architects suggested a decentralised form of management for the Artesan Market. The retail spaces, which have been made as open and inclusive as possible, are operated in agreement by artists, artesans and shopkeepers from various parts of the town, with no central authority, encouraging widespread acceptance of responsibility for the public space while offering incentives for people from different parts of Tlaxco to meet and talk. All while providing the town with a tourist attraction and therefore a source of income and growth for the community as a whole. 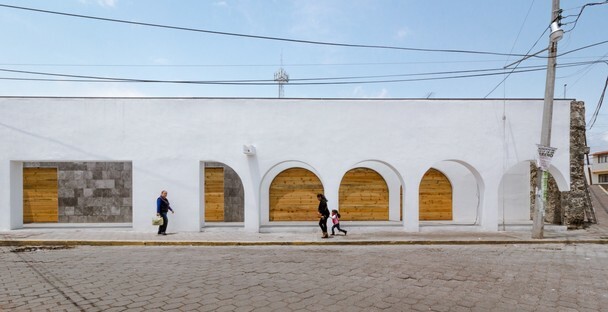 Setting aside its social connotations, from a purely architectural point of view the Tlaxco Artesan Market reclaims a building that was already a market in the past. Its central location, purpose and size were therefore already consistent with this use, and reclamation of almost all the existing walls and foundations were also an important consideration in the choice of the site. The new market is a squared-off L-shaped structure on a single level. The walls are mainly white, interrupted only by portions of restored stone wall and big windows. On the short side of the L, an arcade acts as a preamble for the rest of the construction, letting the sun draw patterns on the white walls with the shadows of the arches and beams. One of the two long sides is punctuated by big windows with dark metal frames, while the other has revolving doors, some square and some with rounded arches, in a homage to wood. 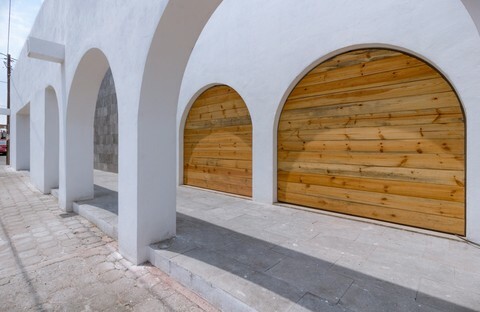 Here wood is used in accordance with the local vernacular tradition, in continuity with the historical and architectural identity of the place. 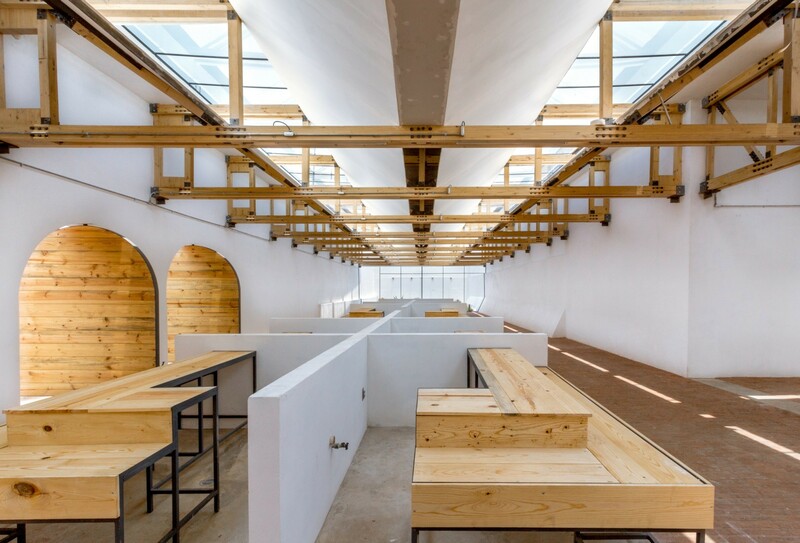 The ceiling is built in the same way, with a light structure of wooden planks and beams that lets plenty of daylight into the interior, amplified by the white walls. 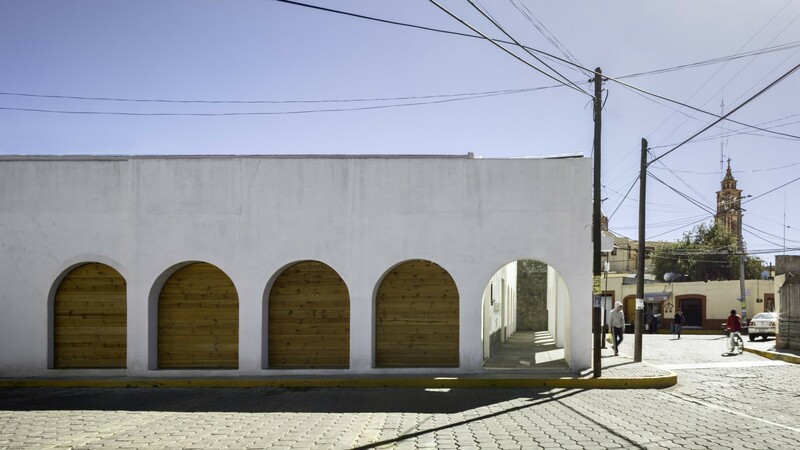 The clean lines and materials used might suggest an austere space, but the brightly coloured decorations and crafts made by the artesans of Tlaxco and the colourful local people make the market a place of colour, celebration and communication.